A Two-Watt Transmitter – 40-Meters and 80-Meters. 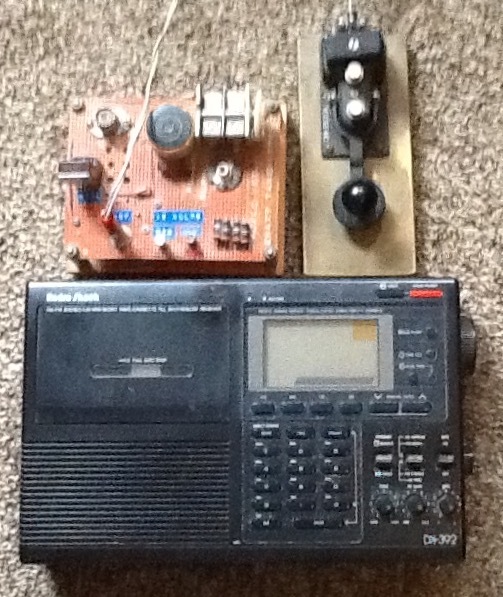 The Radio Shack DX-392 Served As The Receiver. The key is a US Navy Flame-Proof Key. It may be twenty years since Ernie, KB7HCW, and I were busy building low-power radio stations and seeing what they could do. If Ernie hadn’t passed on we might still be at it. Ernie served on 11 ships during 22 years in the US Navy. After retiring he earned an Electrical Engineering Degree and a second Class Radio Telephone License. I met him after he’d set up a shop for repairing CB radios. However, I’m not sure he ever fixed a CB. Instead, he and I spent our time playing, seeing how far we could communicate with “flea-power”. This particular station is built for Morse code – CW. It still has the crystal we used for participating in the Idaho-Montana Section Net. We moved some messages, but we didn’t hurt anyone’s ears doing it. We had fun fun fun.